An experienced take on the developing world. Yes, it’s been a tough year. But EM has never been more essential to a successful portfolio. AGF’s investment management team recently sat down for a special roundtable discussion to discuss the outlook for emerging markets (EM), providing a number of insights that are critical to understanding the current landscape facing investors. Certainly, few would argue with the fact that 2018 has so far been a challenging year for EM assets. But our team’s consensus is that the longer-term outlook is bright and, given the global economic shifts currently underway, investors should consider emerging markets as an integral component in their portfolios going forward. Questions and answers that follow have been edited for clarity and length. Vice-President and Portfolio Manager, AGF Investments Inc. Vice-President, Currency Strategy and Management, AGF Investments Inc. Vice-President and Portfolio Manager, Highstreet Asset Management Inc.
Regina Chi is Vice-President and Portfolio Manager with lead responsibility for AGF Emerging Markets Fund. She has an investment philosophy consistent with AGF's Global Equity Team and looks for quality companies that have long-term sustainable competitive advantages at attractive valuations. Vice-President & Portfolio Manager, AGF Investments Inc.
Tom Nakamura is one of the principal members of the AGF Fixed Income team, which operates through a strong culture of team dynamics that enables each member to leverage their collective talents and strengths. Their global approach derives value from four key factors – country allocation, currency, the yield curve and creditworthiness. Tristan Sones is one of the principal members of the AGF Fixed Income team, which operates through a strong culture of team dynamics that enables each member to leverage their collective talents and strengths. Their global approach derives value from four key factors – country allocation, currency, the yield curve and creditworthiness. Vice-President & Portfolio Manager, Highstreet Asset Management Inc.
Robert joined Highstreet Asset Management Inc. (Highstreet) in 2008 and is responsible for the portfolio management of Highstreet’s non-Canadian equity portfolios. Prior to this, he was an integral member of Highstreet’s research and portfolio management team and was instrumental in the development, enhancement and day-to-day management of Highstreet’s quantitative portfolio strategies, including the non-Canadian equity portfolios. We’re starting to see countries trade on their own merits again, which provides a potential opportunity for active managers. Q: How would you define the investment landscape in emerging markets so far this year? Tristan Sones: There’s been a lot more divergence and a lot more volatility than has been generally the case in the aftermath of the credit crisis a decade ago. In large part, this is because monetary policy is now tightening after a long period of “easy money,” which was needed to support the economic recovery following the financial crisis. But this also masked poor fundamentals in many developing nations. So, because of that, we’re starting to see countries trade on their own merits again, which provides a potential opportunity for active managers. Regina Chi: There’s also been sectoral divergence. Last year, a handful of technology and consumer discretionary stocks were major outperformers and, if you didn’t hold these names, you underperformed in EM equities. This year, there’s been a huge shift in sector performance. Energy is up nearly 18% year-to-date on U.S.-dollar terms. Materials have also been very positive. Robert Yan: The same can be said to sum up the performance of style factors in emerging markets. Large-cap stocks have continued to perform well; however, emerging markets have seen a resurgence of value versus growth during the course of the year. Others like low-beta and high-quality have experienced more V-shaped returns from their previous underperformance. Moreover, factor performance has been quite different across EM regions. For example, growth has worked well so far this year in Europe, Middle East & Africa (EMEA), but in Asia hasn’t performed this poorly since 2008. Tom Nakamura: We’re also seeing differentiation amongst currencies. While broad measures of currencies have been down around 11%, you have several countries like Turkey and Argentina that have seen their currencies depreciate much more than 10%. TS: And we could get more of this differentiation going forward as monetary policy around the world becomes even less coordinated. While the U.S. Federal Reserve (the Fed) has begun to normalize, Europe hasn’t quite started yet and who knows if Japan ever will. Q: How big of an impact have higher interest rates had when it comes to EM weakness across asset classes? RC: The spike in bond yields is definitely one of the catalysts driving the negative performance in EM equities. It’s been compounded by all the trade war rhetoric between the U.S. and China, as well as the bilateral uncertainties between the U.S. and Mexico. TN: Initially, the market didn’t believe the Fed would do four hikes this year, but then came around to pricing that in. The other part of what we’re seeing is the impact of the U.S. central bank’s balance sheet program. You’ve seen this steady increase in how much they’re allowing the balance sheet to shrink, which is also putting some tightening pressure on the markets. TS: The biggest thing in fixed income is probably that the short-term risk free rate in the U.S. is close to 3% now. Cash didn’t yield anything for a decade which made higher-yielding EM bonds much more attractive, but now you’re in a situation where cash is paying you something quite a bit more substantial on a relative basis. RC: Another very big factor for EM this year was elections. You’ve seen the pendulum shift and swing dramatically, whether it’s far right or far left. So, that’s also caused volatility. Populism is a theme in EM, which has ebbed in and out of our asset class. Q: How difficult is it to manage geopolitics and the uncertainty of elections in EM? TS: It’s tricky. We know polling really doesn’t mean much anymore. You can have a base case scenario as to how you think it’s going to go, but it comes down to good portfolio construction and risk management as there’s always the potential for that element of surprise. RC: You have to stay above the noise otherwise you risk getting caught short and being on the wrong side of that trade. It’s just overcoming the short-term transitory risk and looking beyond it. You have to get the stock selection right. TN: Everyone’s trying to position for different probabilities. But, at the end of the day, you’re going to end up with one outcome or another. It’s one thing to campaign and say things. But we don’t really know what the government is going to look like, how effective they’re going to be and how they’re going to be able to execute. It creates this level of uncertainty and unease in emerging markets. RC: But the markets are efficient because they force governments to reform. As we saw in Turkey and Argentina, you had a depreciating currency and you’re now worried about spikes in inflation. The government— no matter how populist they are — they have to conform, otherwise they just get further indebted and it becomes a vicious cycle. Q: Are you bullish or bearish about EM going forward? RY: I am bullish near term considering the level of correction we’ve experienced this year. 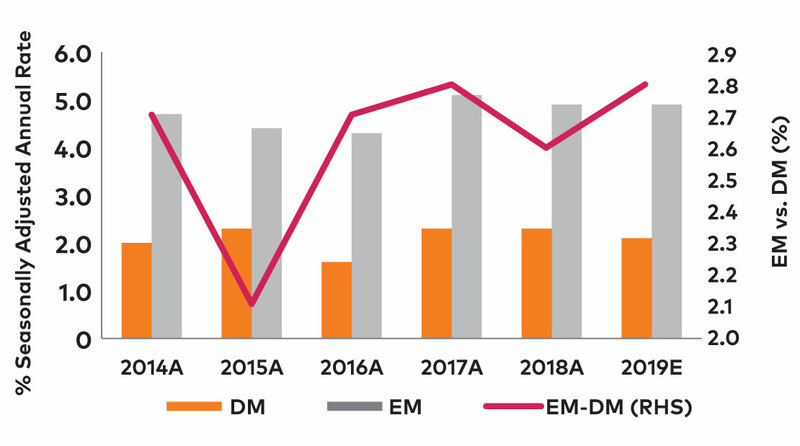 Emerging markets will have periodic bouts of underperformance versus the rest of the world, but in comparison to prior episodes, the last six months of underperformance is extreme as EM has underperformed global equity markets by 14%. This level of underperformance has only occurred 10% of the time since 1998. This presents a compelling opportunity to add exposure to emerging markets. RC: I’m bullish, both near term and longer term because there’s so much valuation support for equities. EM is now trading close to one-and-a-half standard deviations below its five-year average price/earnings multiple. It’s discounting a lot of concerns in the market with respect to rates, currencies, and potentially trade. The big unknown is what’s going to happen with China’s trade agreements with the U.S. Beyond all that, the positive drivers remain firm. So, we’re still excited about emerging markets. Source: Bloomberg Finance L.P. JP Morgan Emerging Market Currency Index (EMCI), as of October 26, 2018. TS: I agree. I feel like there’s been a lot of bad news that’s been priced in. The absolute yield level for local currency EM bonds, for example, is toward the higher end of the range, and the same is true for external (foreign currency- denominated) EM bonds. There are still a lot of headwinds for a lot of countries in terms of their fiscal path, so I’m a bit more sanguine in the medium term. But long term, I think there’s some pretty good entry points if you’ve got a strategic allocation to EM. TN: Very near term, I’m a bit cautious because I think there are a lot of near term risks and China is the big one for me. But I’m much more confident on a multi-year time frame. I don’t think the U.S. cycle can continue to expand its lead over the rest of the world much longer. And if the U.S. starts to fade in terms of importance? That can really change how capital flows and other countries can step up and take on that leadership role. The big unknown is what’s going to happen with China’s trade agreements with the U.S. Beyond all that, the positive drivers remain firm. So, we’re still excited about emerging markets. Q: Where are you seeing some of the better opportunities in EM right now? TS: We prefer local-currency EM bonds mostly because of the weakness in EM currencies. I also think any country that’s serious about their fiscal path and structural reforms will be rewarded. And there’s a huge chance of getting some turnaround stories right. Argentina is a perfect example of that. RC: Our country allocation framework favours countries with low, current-account deficits, like UAE and Thailand where we’re overweight in both countries. UAE has been a big beneficiary of the rising oil prices and they’ve embarked on a fiscal stimulus plan that’s pretty stimulative. In Thailand, there’s also a strong current account surplus, so they’ve been fairly immune to the EM FX weakness. They’ve also benefited from oil prices. Those are two countries that are typically overlooked. Source: Bloomberg, as of October 24, 2018.
time and so EM growth looks attractive. 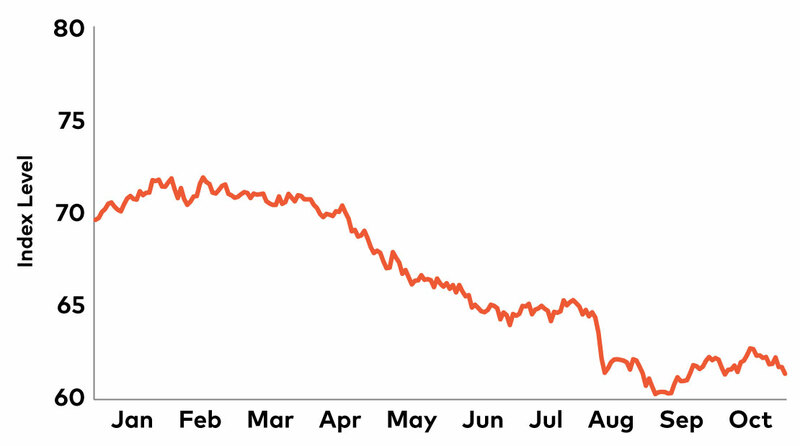 TN: Over the near term, I think Latin American currencies are probably where you’re going to see the broadest gain. If we look to Eastern Europe and Africa, the biggest concerns are in places like Turkey. South Africa and Russia could probably rally a bit more—they’re probably underpriced. We’ve also seen a lot of commodity negativity surrounding China’s growth profile, but I think the markets have overplayed the speed and the global context of that. I think Asian currencies, in general, have some long-term upside and should have a lot less volatility over the next several years. I think Asian currencies, in general, have some long-term upside and should have a lot less volatility over the next several years. Q: Is currency playing a bigger role in EM than it has in the past? TS: The FX component has always been a larger percentage of the actual returns of a global bond portfolio. And a free floating currency often helps to stabilize economies that are under pressure. For example, Argentina artificially held the currency low before letting it float again. This caused inflation to spike higher but has opened up huge potential for the country’s exports. Longer term, it was the right thing to do. TN: It certainly becomes more important in periods of heightened risk because it depends upon whether you think this is a short-term problem or a long-term problem. In cases where you might just think this is the former, you’d probably opt to hedge your currency exposure. What’s interesting with this cycle is that spreads have narrowed and the yield advantage that EMs have typically had [over DM] in the past is much skinnier now. As a result, it hasn’t been as expensive to hedge currencies this year, which allows people to just hedge away the risk. That’s why you’re getting some pretty pronounced moves in currencies. Q: Given this backdrop, how important is EM in the context of a diversified portfolio? TS: : I think there’s been a reluctance over the years for Canadian investors to go outside of Canada for fixed income. People want the fixed income side to be as stable as possible, thinking, ‘’I’ll take some risk on the equity side instead,” but they potentially lose out on some good opportunities because of that. And I don’t think you really need a lot of exposure—there are benefits to having just a sleeve of EM bonds in your portfolio. Especially for local currency issues. When you look at total returns and asset allocations, it has served us well over a full cycle. RC: You have to remember that the economic growth is in EM. Consider that we see GDP growth over 6% in places like India and China, whereas in developed markets, GDP growth is slightly over 2.3%. Emerging markets are also now a more domestic consumption story. In the past, it was predominantly energy and materials, which may not have provided much diversification. This is particularly true for Canadian investors given the similar makeup of their domestic equity market. TN: And if President Trump and President Xi have some kumbaya moment and all of the tariffs come down and there’s even freer trade than we had several years ago, this will allow greater access into the Chinese market, which is positive for all of the emerging markets. Emerging markets will have periodic bouts of underperformance versus the rest of the world, but in comparison to prior episodes, the last six months of underperformance is extreme. Q: And if that doesn’t happen? TN: Well, we could see the global economic structure splinter. Whether it’s in two pieces – one led by China, one led by U.S. – or whether it’s into multiple pieces, you end up in a world where you have a lot more closed economies, or closed groups of economies. As horrible as that sounds, it’s even a stronger case for diversification because everybody’s going to be on a different economic cycle. Commentaries contained herein are provided as a general source of information based on information available as of October 30, 2018 and should not be considered as personal investment advice or an offer or solicitation to buy and/or sell securities. Every effort has been made to ensure accuracy in these commentaries at the time of publication; however, accuracy cannot be guaranteed. Market conditions may change and the manager accepts no responsibility for individual investment decisions arising from the use of or reliance on the information contained herein. Investors are expected to obtain professional investment advice.